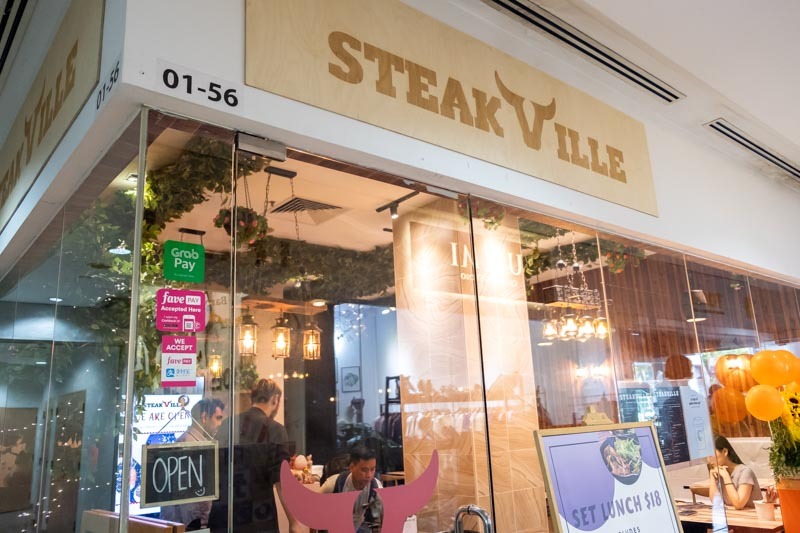 If you’re a steak lover, then you’ll want to visit Steakville at Sunshine Plaza. The cuts of beef are imported from various farms around the world to ensure what they serve is of the best quality. Come early if you are looking for a seat at Steakville, because there’s limited seating capacity of 25 diners. I am a huge fan of wood furnishings, so I was naturally captivated by the cosy vibes of the restaurant’s interior. Who can say no to cheese? The Truffle Cheese Wedges ($14) came with a heavenly mix of truffle oil, truffle mayonnaise and nacho cheese. We could immediately smell the distinct aroma of truffle the moment it was placed on the table. The potato wedges had a crispy outer layer, and the dish was drenched with a generous amount of nacho cheese and truffle mayonnaise. There is something about nacho cheese that is just so addictive. That familiar salty and creamy nacho cheese coated every single potato wedge. While this was a simple dish, I found myself constantly reaching out to this cheesy starter. Although Steakville specialises in steak, they also whip up a pretty good chicken dish. The Brown Buttered Chicken ($15) is a portion of a slow-cooked chicken breast in butter, topped with seared garlic, and herbs. The moment I cut into the Brown Buttered Chicken, the crispy skin emitted a satisfying crackle, revealing the thick, juicy chicken breast meat. The melted pool of butter made the Brown Buttered Chicken helped to enhance the flavour of the chicken meat. The slices of seared garlic also infused the chicken breast meat with a prominent garlic flavour. It is easy to mess up the texture of chicken breast. Too much heat and all the moisture within the meat will be robbed away by the fire. Too little heat and you’ll probably get food poisoning from consuming raw chicken. Lucky for us, the Brown Buttered Chicken was grilled to perfection, and the tender, succulent chicken breast was a joy to munch on. Steakville’s Signature Hanger Steak ($15, 150g) was a cut of beef steak that’s prized for its flavour. It came with house salad, beetroot puree, truffle mustard and sea salt. We had it medium rare, and its nice shade of reddish-pink is something that I personally love. While the steak was tender, we found the gamey flavour to be overpowering at times. That’s when you can sprinkle some sea salt on the beef to neutralise the gaminess of the beef. As the name of the dish suggests, the origin of the Chef’s Selected Wagyu ($38) would differ from time to time, depending on where the chef chooses to import the beef from. For this serving, the beef was from Australia, with a marbling score of seven. One thing we realised was how uneven the marbling of the Chef’s Selected Wagyu was as most of the fats were concentrated at the centre of the beef. The fatty meat was really soft and had a very rich taste. It was just as gamy as the Signature Hanger Steak, so sprinkle some sea salt to counter the taste if you are not a fan of the gaminess. Steakville has collaborated with Candour Coffee Bar to give customers a taste of quality coffee. We were introduced to coffee cocktails, a concoction of espresso and alcohol. The classic Irish Coffee ($15) had a mix of coffee, whisky, panela syrup, and fresh cream. The espresso base was very prominent, with a gentle hint of whisky lingering in the background. The layer of milky foam also went well with the smooth and sweet Irish Coffee. SCONG ($20) is named after one of the founders of Candour Coffee Bar, Shi Chun Ong. It is a concoction of espresso, dark rum, Kyoho grape liqueur, and St. Germain liqueur — I’ll have to warn you, this is one strong drink. The grape notes on this drink was apparent, followed by a mild, tangy orange peel taste. The espresso aroma was also quite strong. This bitter-sweet brew, though high in alcohol content, was surprisingly easy to drink. With their premium selection of beef cuts and delicious meats, carnivores like me who swear by meat will definitely love Steakville. For adventurous drinkers, don’t forget to order some coffee cocktails along with your meal!